‘Bright Stripes’ square buttons. 2.5cm x 2.5 cm approx. £2 per pack of 2 buttons excl. p&p. 5 in stock. ‘Blue Stripes’ square buttons. 2.5cm x 2.5cm approx. £2 per pack of 2 buttons excl. p&p. 2 in stock. 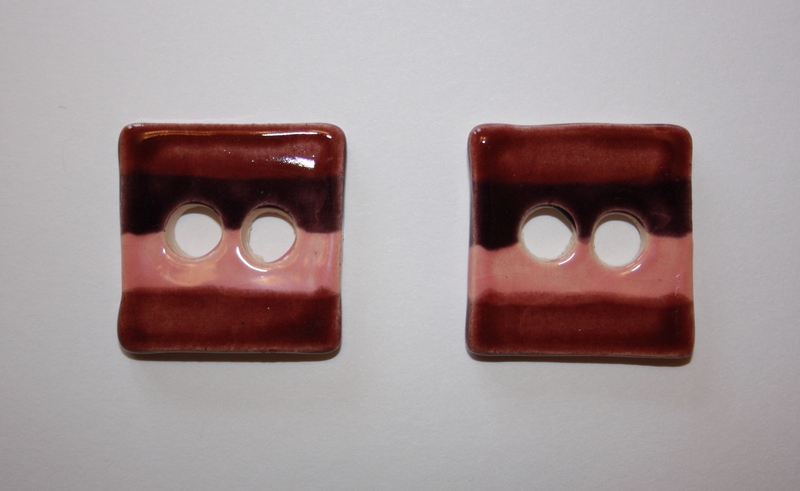 ‘Pinks & Purple Stripes’ square buttons. 2.5cm x 2.5cm approx. £2 per pack of 2 buttons excl. p&p. 9 in stock. ‘Greens & Purple Stripes’ square buttons. 2.5cm x 2.5cm approx. £2 per pack of 2 buttons excl. p&p. 6 in stock. ‘Oatmeal Quarters’ square buttons. 2.5cm x 2.5cm approx. £2 per pack of 2 buttons excl. p&p. 12 in stock. ‘Denim’ chequered large round button. Diameter – 6cm approx. £3 each excl. p&p. 1 in stock. ‘Foliage Green’ chequered large round button. Diameter – 6cm approx. £3 each excl. p&p. 1 in stock. ‘Oatmeal Quarters’ small round buttons. Diameter – 3.5cm approx. £2 per pack of 2 buttons excl. p&p. 10 in stock. ‘Oatmeal Halves’ small round buttons. Diameter – 3.5cm. £2 per pack of 2 buttons excl. p&p. 10 in stock. ‘Rock Pool Green & Blue Effects Quarters’ small round buttons. Diameter – 3.5cm approx. £2 per pack of 2 buttons excl. p&p. 13 in stock. ‘Kiwi & Rock Pool Green Quarters’ small round buttons. Diameter – 3.5cm. £2 per pack of 2 buttons excl. p&p. 5 in stock. ‘Turquoise & Mottled Blue Grey Quarters’ small round buttons. Diameter – 3.5cm approx. £2 per pack of 2 buttons excl. p&p. Out of stock. ‘Ice Crystal’ small round buttons. Diameter – 3.5cm approx. £2 per pack of 2 buttons excl. p&p. 6 in stock. ‘Mottled Blue Grey’ small round buttons. Diameter – 3.5 cm approx. £2 per pack of 2 buttons excl. p&p. 12 in stock. ‘Blue Effects & Caribbean Blue Quarters’ small round buttons. Diameter – 3.5cm approx. £2 per pack of 2 buttons excl. p&p. 7 in stock. ‘Pink Polka Dots’ small round buttons. Diameter – 3.5cm approx. £2 per pack of 2 buttons excl. p&p. 11 in stock. ‘Blue Polka Dots’ small round buttons. Diameter – 3.5cm approx. £2 per pack of 2 buttons excl. p&p. 10 in stock. ‘Green Polka Dots’ small round buttons. Diameter – 3.5cm approx. £2 per pack of 2 buttons excl. p&p. 8 in stock. ‘Xmas Tree Green’ small round buttons. Diameter – 3.5cm approx. £2 per pack of 2 buttons excl. p&p. 4 in stock. ‘Chequered Plum’ small round buttons. Diameter – 3.5cm approx. £2 per pack of 2 buttons excl. p&p. 1 in stock. ‘Chequered Denim’ small round buttons. Diameter – 3.5cm. £2 per pack of 2 buttons excl. p&p. 2 in stock. ‘Plum With Orange Dots’ small heart buttons. Height – 2.5 cm approx. £2 per pack of 3 buttons excl. p&p. 6 in stock. ‘Kiwi With Holiday Green Dots’ small heart buttons. Height – 2.5cm approx. £2 per pack of 3 buttons. 7 in stock. ‘Pink With Plum Dots’ small heart buttons. Height – 2.5cm approx. £2 per pack of 3 buttons excl. p&p. 4 in stock. ‘White With Grey Dots’ small heart buttons. Height – 2.5cm. £2 per pack of 3 buttons excl. p&p. 3 in stock. ‘Ice Crystal’ small heart buttons. Height – 2.5cm approx. £2 per pack of 3 buttons excl. p&p. 2 in stock. ‘Caribbean Blue With Cobalt Dots’ small heart buttons. Height – 2.5cm approx. £2 per pack of 3 buttons excl. p&p. 7 in stock. ‘Lilac With Kiwi Dots’ small heart buttons. Height 2.5cm approx. £2 per pack of 3 buttons excl. p&p. 9 in stock. ‘Lilac With Cobalt Dots’ small heart buttons. Height – 2.5cm approx. £2 per pack of 3 buttons excl. p&p. 8 in stock. ‘Blue Effects’ small heart buttons. Height – 2.5cm approx. £2 per pack of 3 buttons excl. p&p. 8 in stock. ‘Rock Pool Green’ small heart buttons. Height – 2.5cm approx. £2 per pack of 3 buttons excl. p&p. 12 in stock.